– BEST WEEK OF 2018 SO FAR! Water – Surface temps 85. Blue and clear! Fishing – Maybe the best of the season. 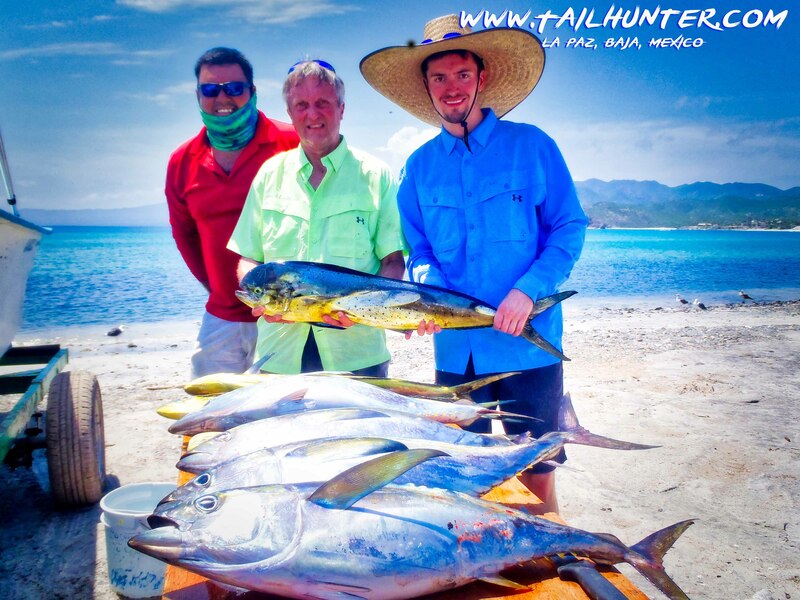 More tuna than any other week in terms of sheer volumen…our largest dorado so far…solid roosterfish too. Wahoo showed up as did billfish, cabrilla, pargo and other species . Limits most day and some fishing was done by late morning! Catching – Lost some big tuna. Lost some big dorado. Lost some big billfish! That’s why they are BIG fish! Thumbs up for sure! 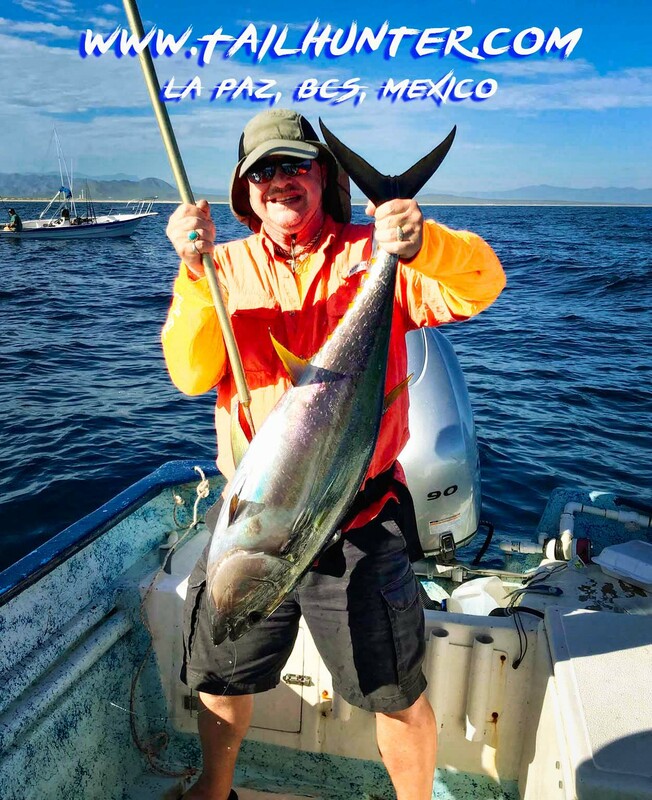 Captain Adolfo with Trey Shuck and Trey Nichodemis with a double-stack of tuna and dorado their first time fishing Las Arenas and visiting La Paz! 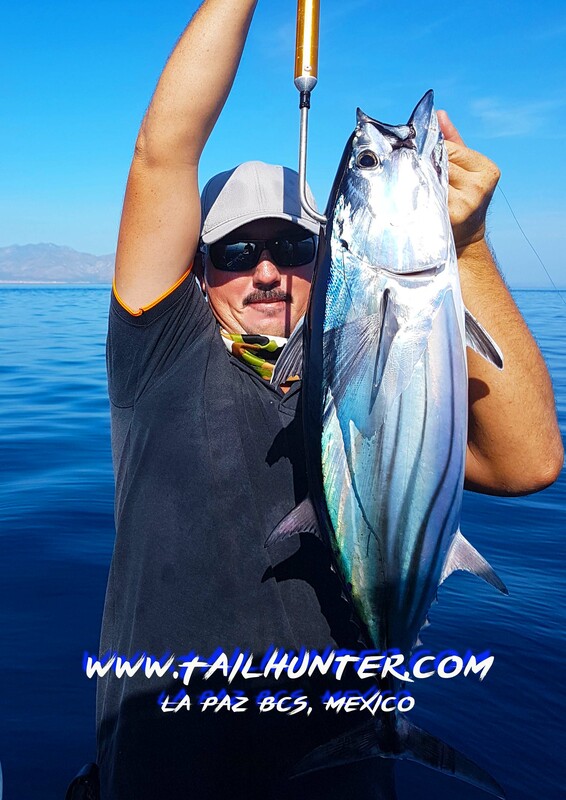 Captain Gerado with Stacy Florence from Kansas City…after loading on tuna, why not go try for roosters? Big boy gallo in the boat! Wow! Fish was released. Great start! 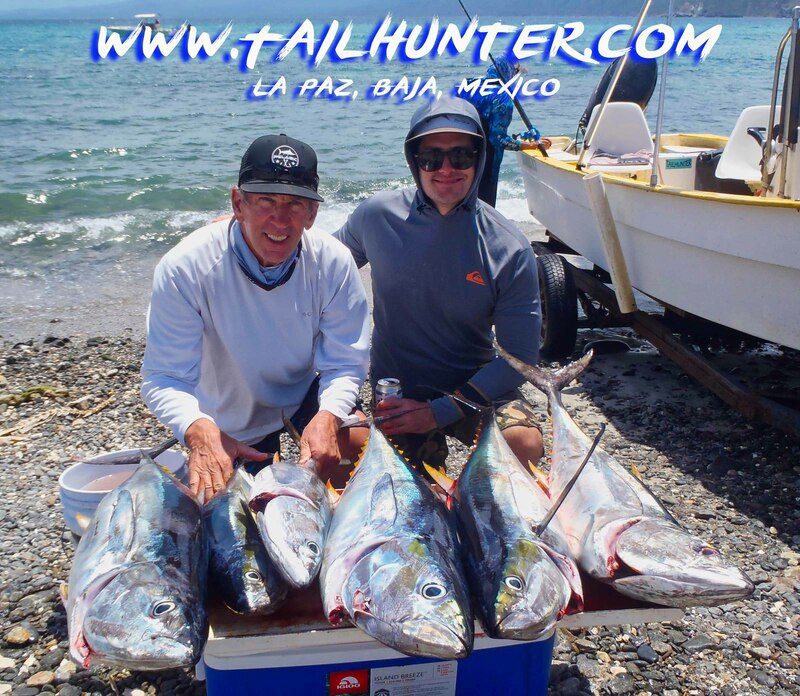 First day on the water produced a big load of tuna plus a dorado for Adam and Riley Florence who always visit us this time of year from Kansas. 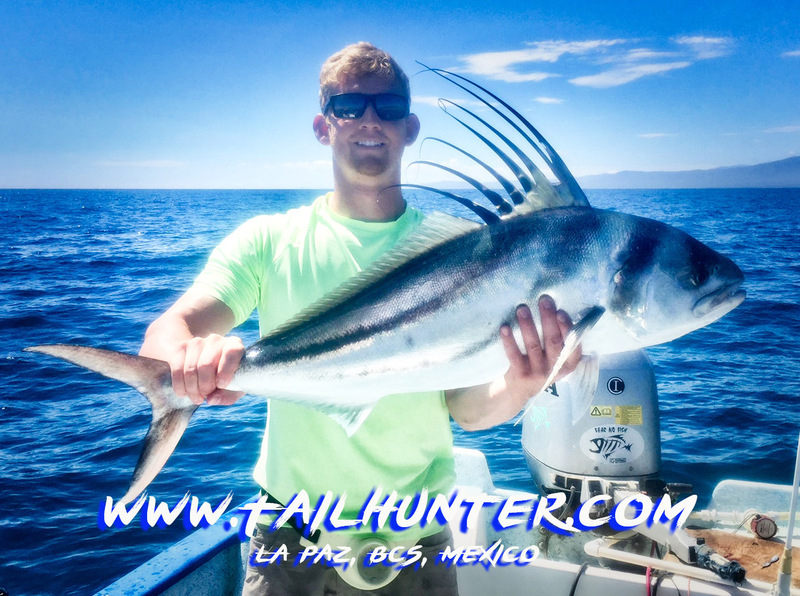 First-timer luck and a big roosterfish for Sam Rumble who took this off Punta Perico. Sam is from Ripon CA. No complaints on a fishing day that produces results like these! 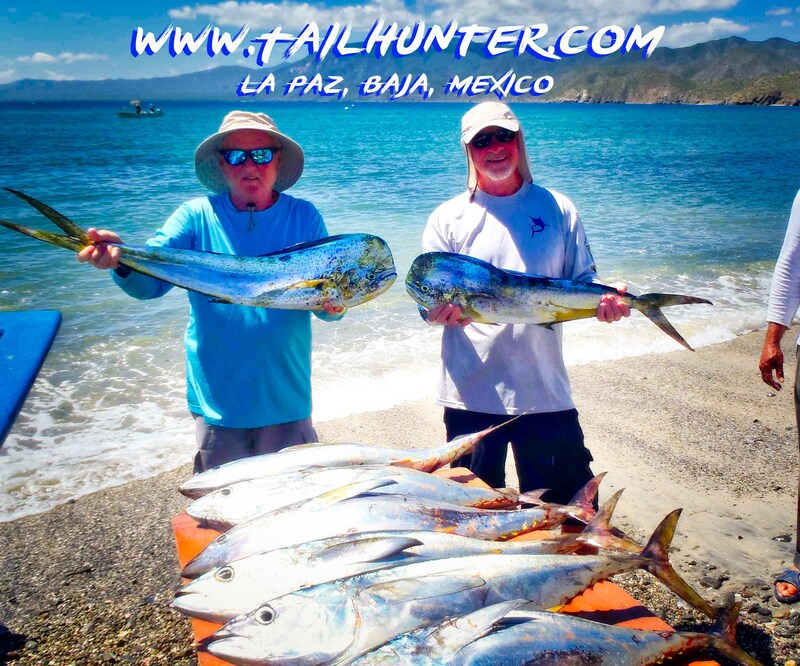 Lynn Marolf and Mike Wilbur had three days like this of dorado and tuna! 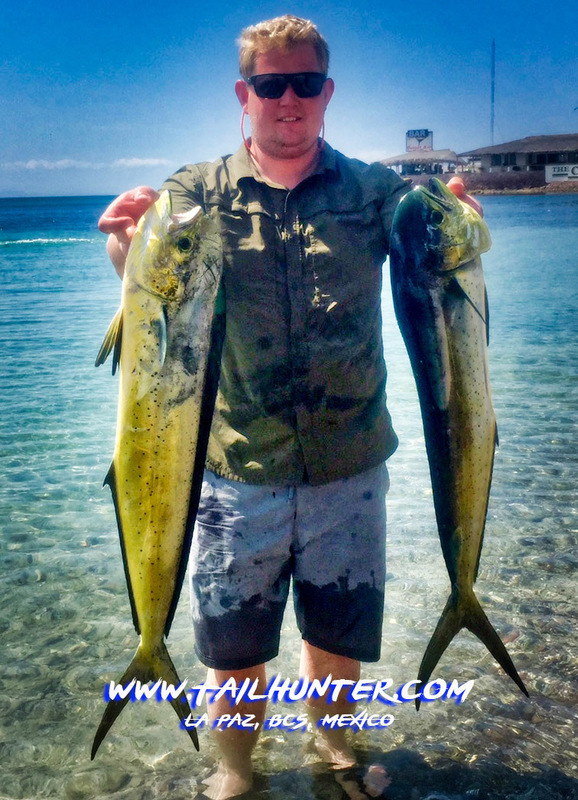 Tim Rumble poses with a pair of his dorado caught just north of La Paz on his first day fishing. Check out the racing stripes on this tasty white bonito that Gordo is holding. Pretty fish. 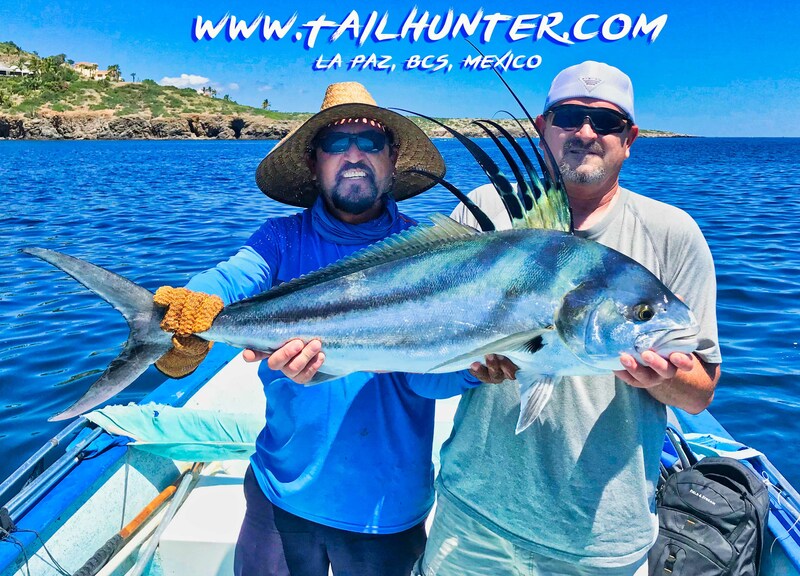 These two are crazy fishermen and visit us several times a year, good amigos, Jim and his son Dan Bovee from San Diego said they stopped fishing for tuna by 9:30 and could have had “all they wanted.” Fishing was THAT good! 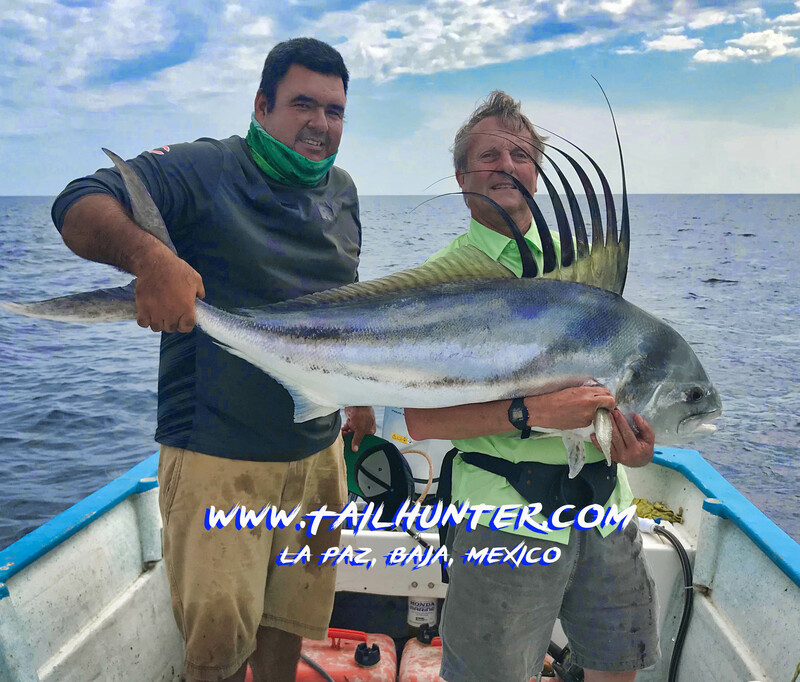 From Stockton, James Giovannoni, put the stops on this beautiful roosterfish just there in the shallows off Punta Perico with Captain Jorge. The fish was released. 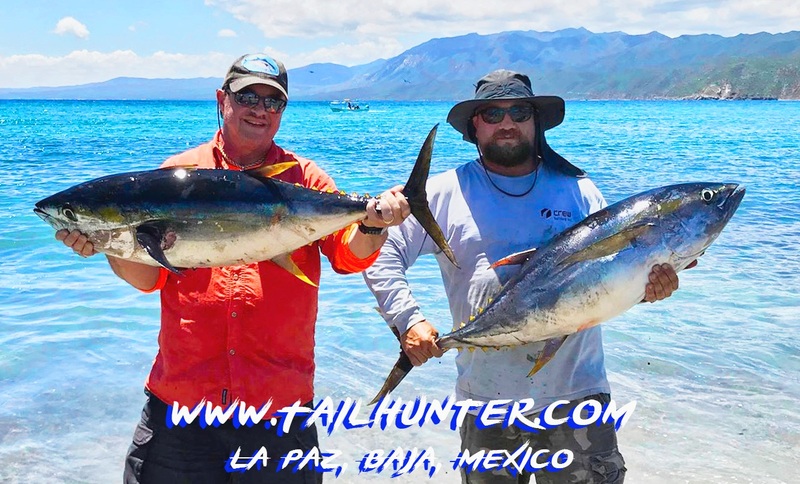 Using light tackle and shorty rods, Al Schneider from Orange CA and Ryan Netherton from San Deigo CA, got tow of the larger tuna of the week . The two used to fish together as kids but had not fished together in 30 years! Riley Florence was with Captain Pancho when he decided to pull out a crank bait he picked up in Florida. Check it out! It’s black with white with pink polka dots? The new hot thing? It sure worked. He dropped it back and this wahoo chomped on it! 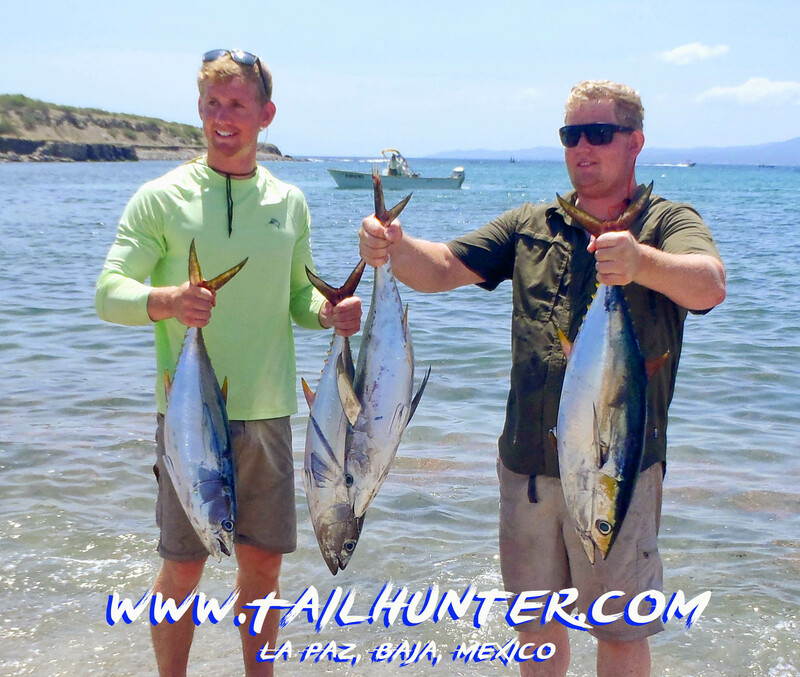 Nice pose and fat tuna for Phil Buckingham from Pennsylvania and Jared Overholtzer from CA. First timers with us had a great time. Captain Gerardo photobombs Stacy and Josh Florence after another great day on the water! Happy fella, Vito Cipponeri gets his first roosterfish with Captain Jorge off the rocks near Punta Perrico. 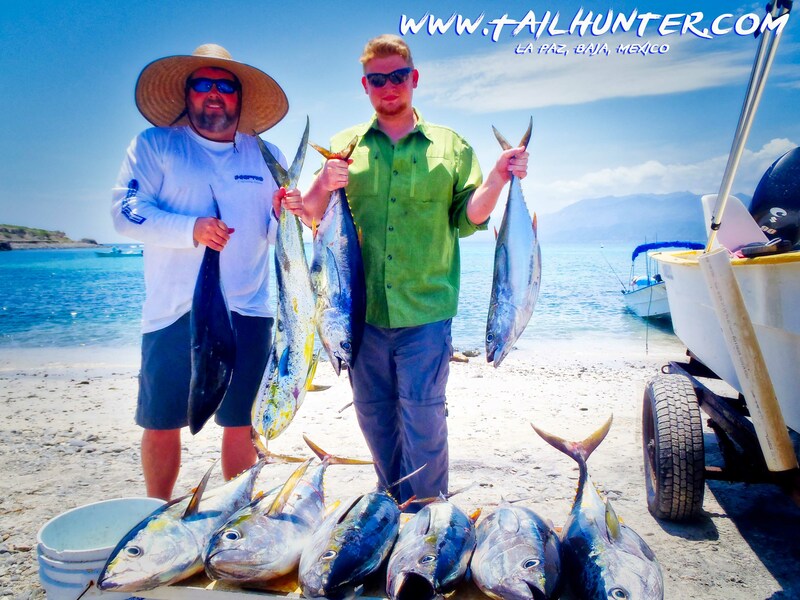 The Rumble Brothers, Sam and Tim, on the beach at Muertos with some of their yellowfin tuna. 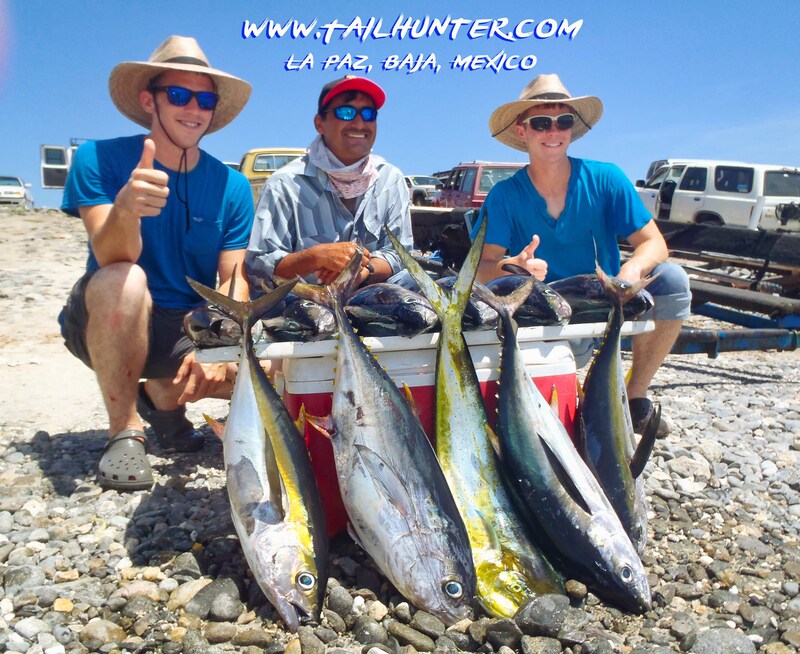 The hat trick of wahoo, tuna and dorado for Riley and Adam! Last day and full coolers to take home! Not a bad day on the ridge! 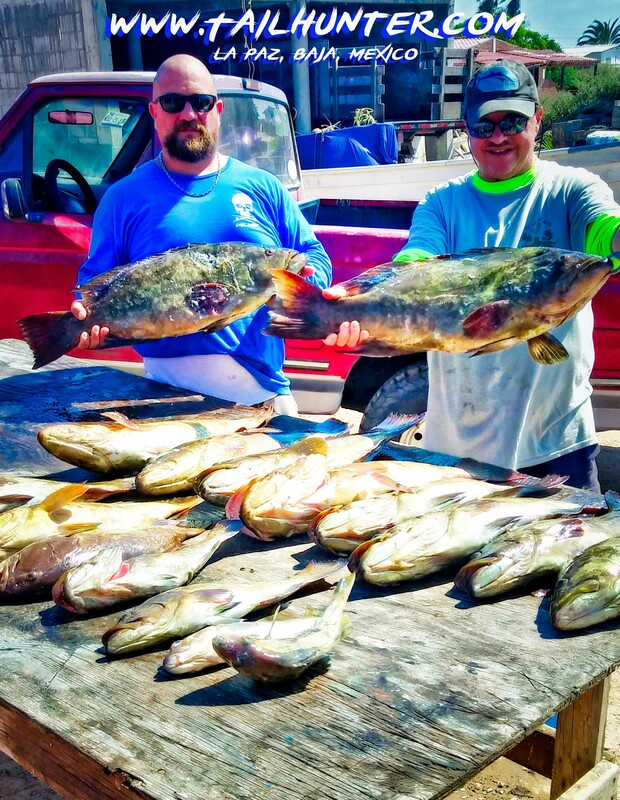 Lots of grouper to clean for Ryan Netherton and Al “El Al” Schneider after spending a day with our Magdalena Bay outfit. 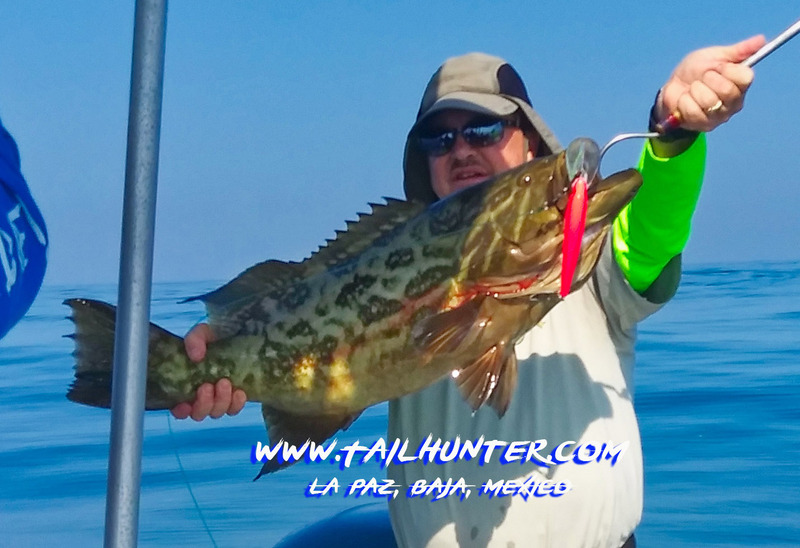 Pretty grouper on the gaff and stuck on a jig! Al Schneider rocked this one bouncing the jig on the bottom. Forget the full moon or big moon! I think we just had the best week of our 2018 season. 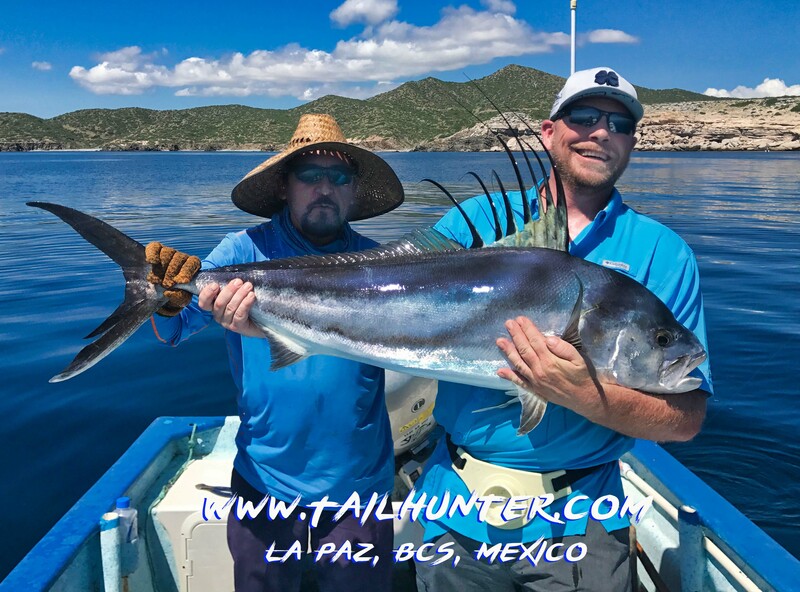 More tuna…bigger dorado…wahoo…billfish…and everyone who wanted a roosterfish got at least one! On top of it, maybe the best weather of the year with sunny days; cool nights and flat blue waters! Wow! What a week. I don’t know how long it will last, but it was sure good this week and maybe it’s shaping up to be a the kind of fall we had last year in 2017 when we had two months of fishing like this. 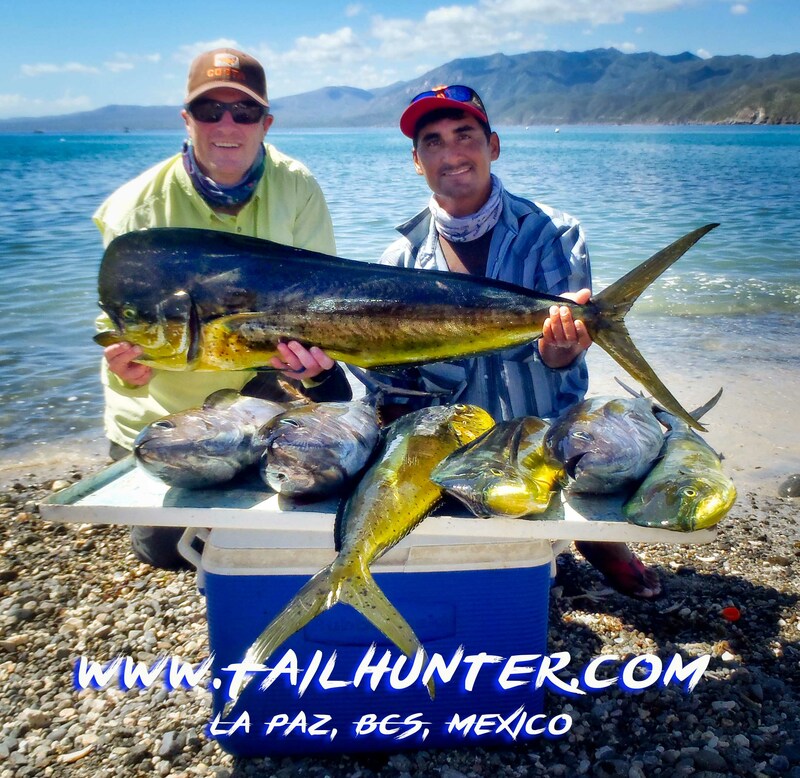 For our Tailhunter La Paz fleet, everyone got limits or near limits of dorado. Fish ran in the range of 10-25 pounds and it was pretty much a sure thing . Could not miss. The fish were scattered over a wide range and no matter which way you went out’ve the bay, you would eventually hit some dorado. 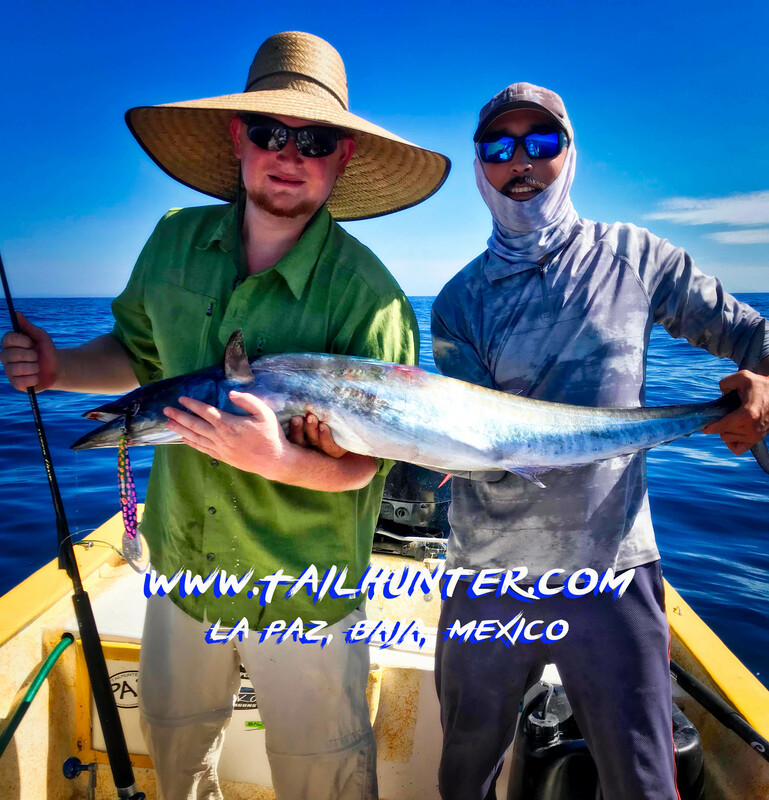 Add to that some pargo, cabrilla, some billfish and roosterfish hookups and even some unusual yellowfin tuna up to 40 pounds and, despite the occasional slower day or boat, most of our clients were releasing fish or coming back early. For our Tailhunter Las Arenas fleet…it was nothing short of spectacular most days! 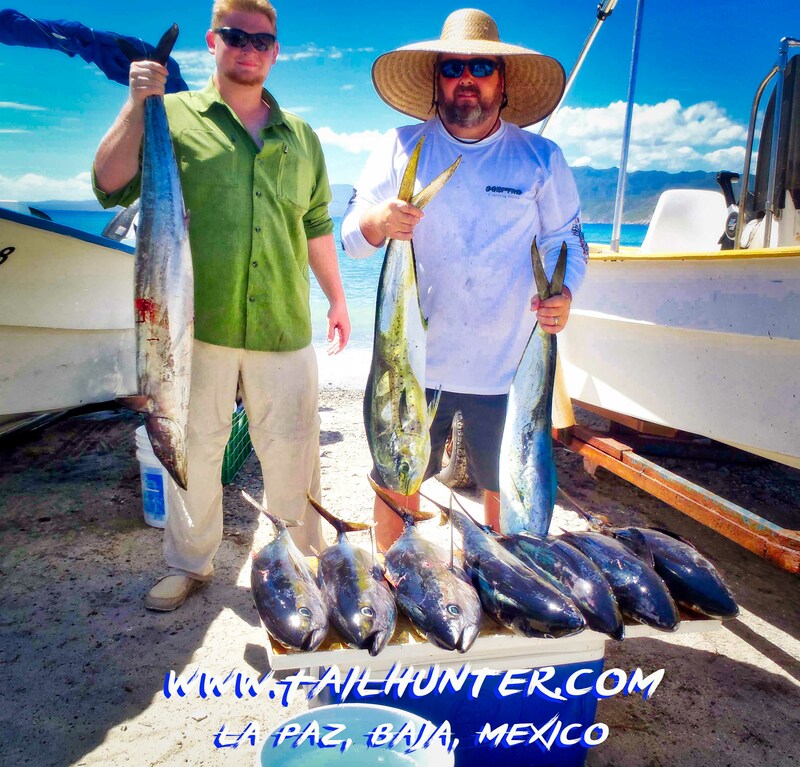 Yellowfin tuna in the 10-20 pound size were just outside of Bahia Muertos. Most of the time…all you wanted! Limits by 9 or 10 a.m. then go find some other species or come in back to the beach! It was THAT good. Go out a tad “further” (just down the beach and out a ways), the fish jumped to 40-60 pounders! In the same tuna areas, dorado up to 40 pounds and schools of smaller dorado would range in or could be found not far away. Others would go looking for roosterfish and in a year when we have not caught many rooster…everyone who wanted a rooster caught one…or two! Fish up to 60 pounds were right there. One day we caught 8 roosters. That was more than we’ve caught in the last 2 months. Even boats that thought they were done for the day sometimes could not help catching fish. Several boats were already coming in and slowly dragging lures back to the beach and got jumped by wahoo in 20’ of water! What a week. Hope it holds, but this coming week, we’re watching the weather. Looks like we’re gonna have some tropical thunder and lightning storms coming through on-and-off. Fingers crossed. Most times it’s in the afternoon and evenings. As long is there’s not a lot of wind, we should be OK.